In this article we discuss TemperatureAndTint, the Composition API effect that -unsurprisingly- allows you to adjust the temperature and/or tint of an image. The Temperature property of the TemperatureAndTint effect does not stand for the color temperature of the image itself, for the relative change in color that is caused by the effect. It is defined as a float between –1 and 1. The Tint property is also a value in the range from -1 to 1. The standard unit measure of Color Temperature is degrees Kelvin (K) -a variation of Centigrade a.k.a. degrees Celsius- and it ranges from 1000 to 10000. It was discovered in the late 1800’s at a Scottish barbecue. Physicist and mathematician Lord William Kelvin heated a block of carbon and observed its glow producing a range of different colors at different temperatures. The heated black cube first produced a dim red light, increasing to a brighter yellow as the temperature went up, and eventually produced a bright blue glow at the highest temperatures. These observations led to a color temperature scale based on a theoretical “ideal black body”. Funny enough, the bluish light -which corresponds to the higher color temperature- is described as cool. So warm and cool refer to the color, not to the temperature. Most computer screens and televisions have a color temperature of 6500 K. That’s why you see a blue glow through the windows when you drive by someone’s house at night. Let’s see how we can use the notion of Color Temperature on the Universal Windows Platform, and find some use cases for it. 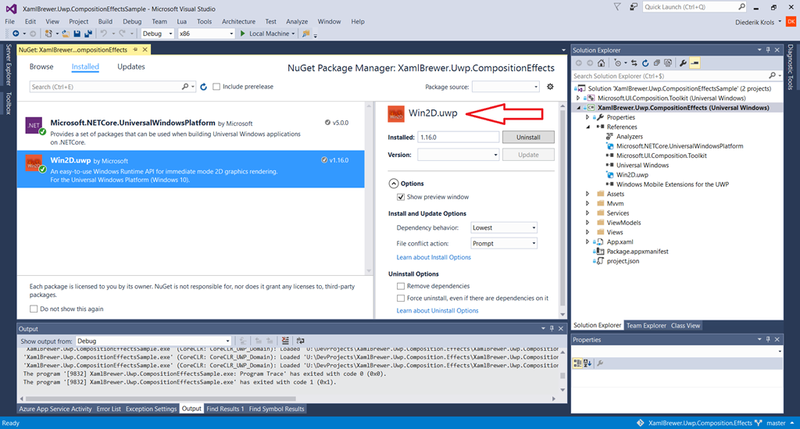 In Visual Studio, make sure that your UWP project references the Microsoft UI Composition Toolkit project, and install the Win2D UWP Nuget package. For more info on the configuration and initialization of the different Composition API citizens, read my previous article. // Create the effect, but don't specify the properties yet. // Create and apply the brush. // Apply parameter to brush. Tip: You can avoid hardcoded strings by using the nameof() operator. Some of the Composition API effect related methods require parameters in the name-of-the-effect.name-of-the-property format, like “temperatureAndTint.Temperature”. With the nameof() operator you can get to the name of a variable, type, or member at runtime. That allows you to avoid the hard-coded strings to better survive refactorings. 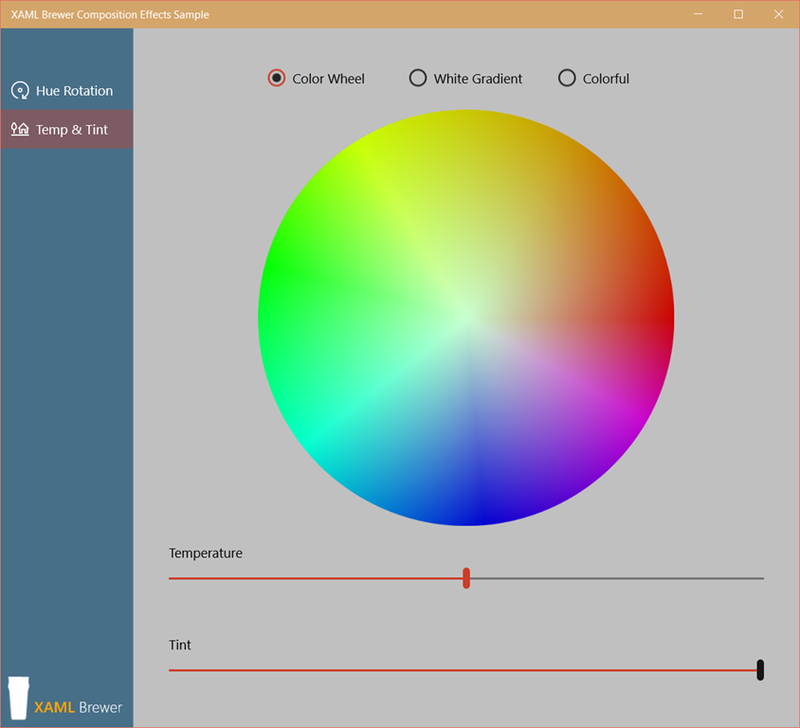 The most common use of Color Temperature in software is white-balancing pictures. Our brain automatically adapts to different lighting colors: we perceive a white T-shirt as white whether we are indoors and using warm artificial lighting or outdoors in sunlight. Our eyes and brain recalibrate what we read as white, based on our experience and points of reference, but a camera does not. 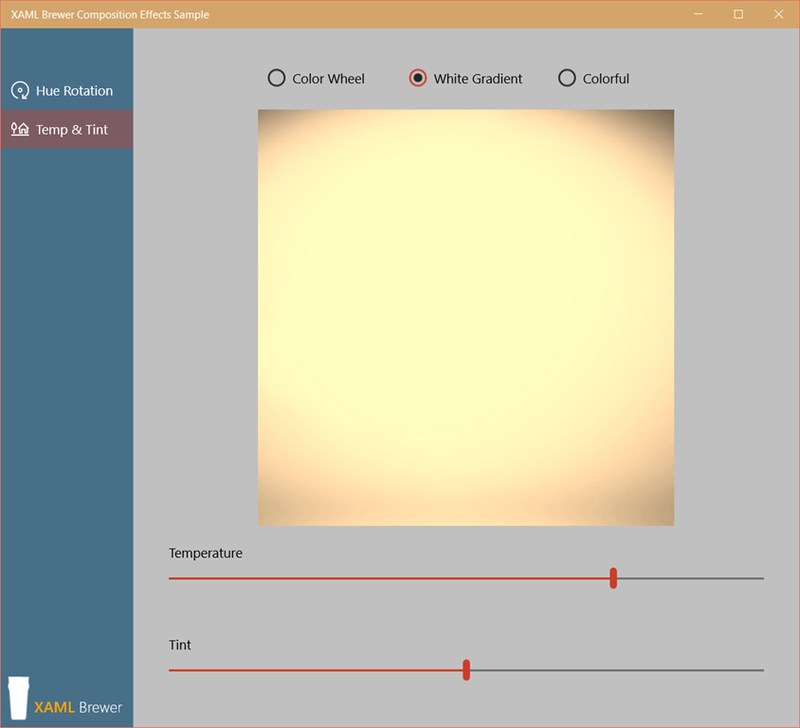 When taking a picture, the camera needs to be properly configured to the correct color temperature setting. If it’s not well done, the image needs to post-processed. 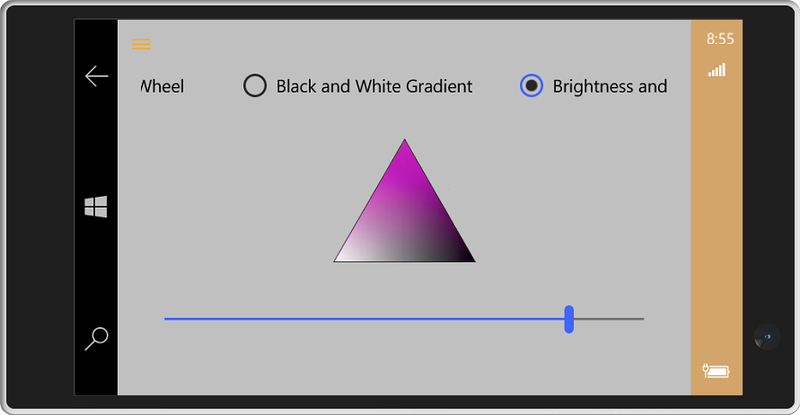 Many photo editor apps come with a slider for the Temperature in the Red-White-Blue scale, and a slider for the Tint in the Green to Magenta scale to do minor adjustments. That’s exactly what the sample app does, so let’s move to other usages of Color Temperature. The TemperatureAndTint effects provides you with an opportunity to make text better readable and interacting with your app more comfortable and less fatiguing. If you are reading a book, the pages will always appear white – no matter what light source you’re under. But pure white is not always the ideal background. For some apps, it makes sense to adjust the background color based on your user’s environment (indoors or outdoors) or the time of day (day or night): blue is a better background in full sunlight, and soft yellow-to-orange tones are better for reading bed-time stories. There already is a huge range of apps available that monitor the light conditions (or use history data) and adapt the screen setting accordingly. For a good example, take a look at f.lux. 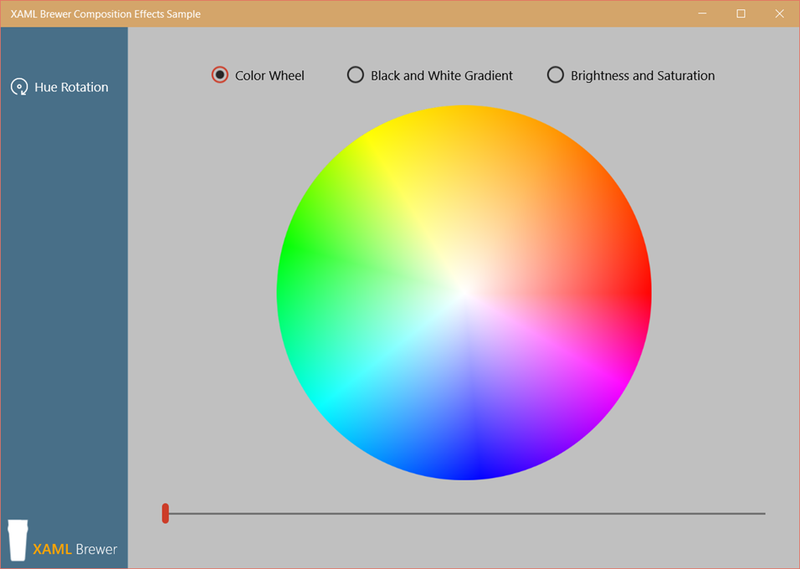 Apps on the Universal Windows Platforms have no write access to screen settings and system colors. But nothing prevents you from using a pale background image in your app and changing its color temperature through the Composition API. In the image on the left, the blue area is nicely highlighted. In the image on the right, the red area gets all the attention. 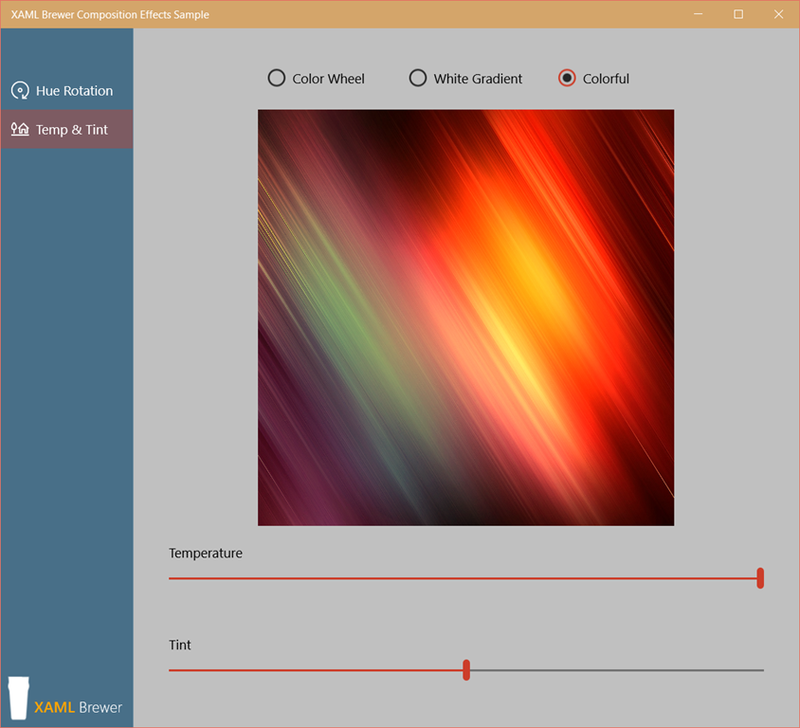 So adjusting the Color Temperature (or Tint) can be used to temporarily highlight different zones in your UWP app, and this can be done with animation. This entry was posted in Composition API on April 19, 2016 by xamlbrewer. In this article we play around with the Hue Rotation effect, which is one of the UWP Composition Effects. 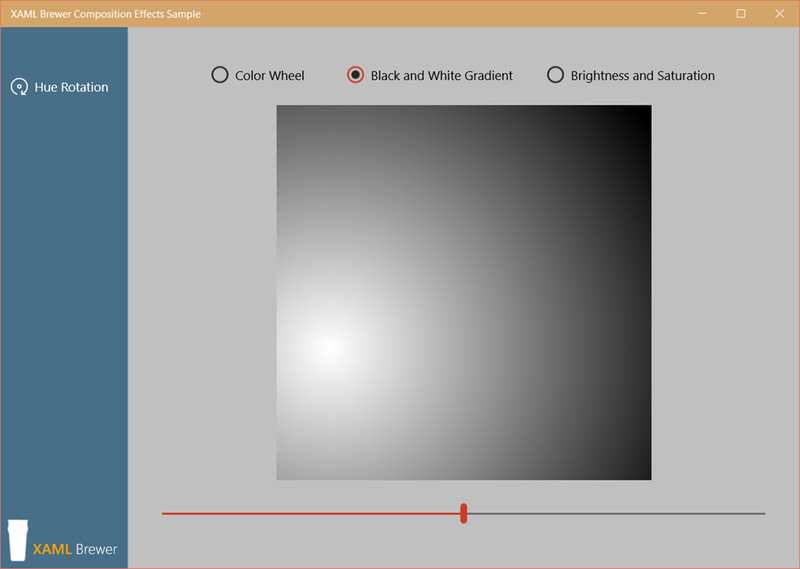 This effect allows you to apply a rotation to all of the colors of an image in real-time. The effect takes one parameter -the rotation angle- which is a float value between 0 and 2π. When you move the slider slowly from its minimum to its maximum value, you’ll see that the image appears to rotate clockwise. It looks like a RotateTransform, but we’re actually just shifting the colors of the bitmap. The color shift is not linear however: for some rotation angles the yellow range entirely disappears – like in the screenshot in the middle. That’s because in color theory nothing is linear: everything is based on non-linear physical characteristics as well as on biological ones (how the human eye works). There is an awesome and well-readable introduction to all of this right here. 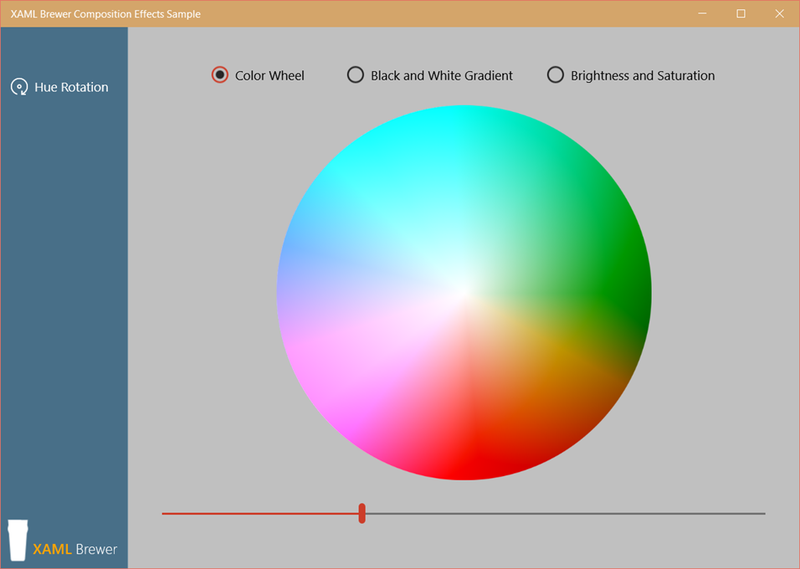 So rotating colors may look easy at first sight, but it’s definitely not. The Hue Rotation effect actually applies a color matrix in the red-green-blue space. The matrix depends on the rotation angle. Enough introduction, let’s fire up Visual Studio now. // Initialize Composition UI infrastructure. 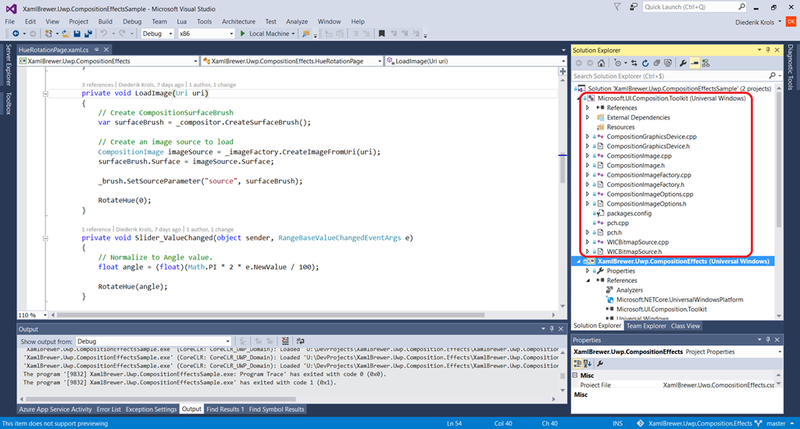 // Hook the sprite visual into the XAML visual tree. All the previous code is further explained in this article of mine on the basics of the Composition API. We first define the effect, where we specify the name of the image brush that will be used as Source, but we omit the Angle. create a brush that holds the effect, through CreateBrush(). // Create the effect, but don't specify the Angle yet. An effect needs pixels to work on, so it is always chained to a CompositionSurfaceBrush which can hold a color, a bitmap, or an effect. The last line of the previous snippet –the SetSourceParameter() call- connects the effect brush to the image brush. We now have a nice playground to test the effect on different images. H stands for Hue. This is the color’s position on the color wheel, generally expressed in degrees from 0° to 359° where 0° represents red and 180° corresponds to red’s opposite color – cyan. S stands for Saturation, the purity of the color, or how far it is from any shade of grey. It is expressed as a percentage. L and V stand for Lightness and Value (a.k.a Brightness). These are two different ways of specifying how far away the color is from black. Both are expressed as a percentage. For more definitions (chroma, luma, luminance, colorfulness and so on) and more exact definitions and formulas, start reading here. 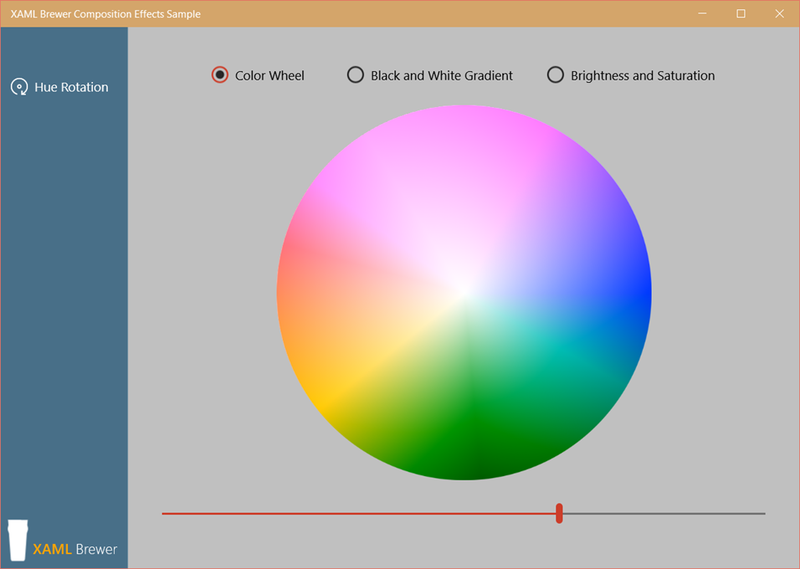 The color wheel on the outside of the color picker, allows you to easily pick the base color (the Hue). 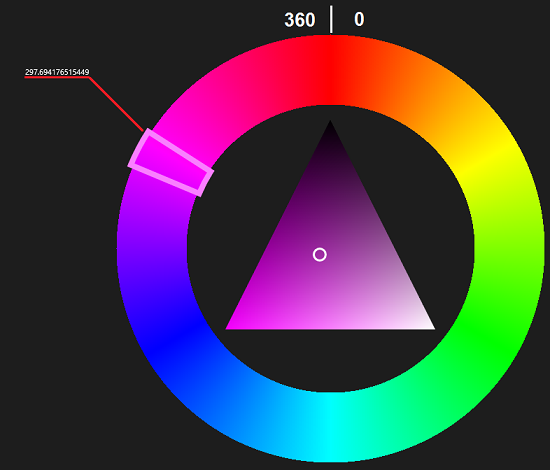 The triangle on the inside manages the two other properties: Brightness and Saturation. 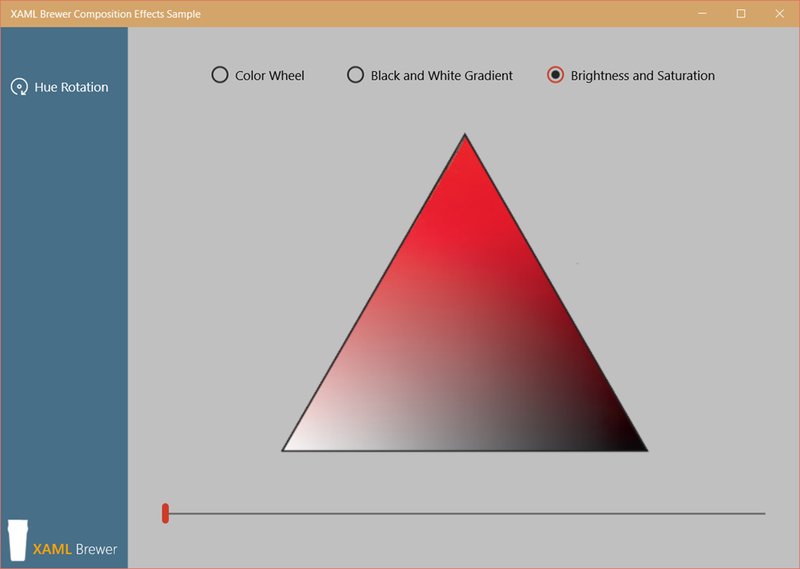 If you dive into the code of the WinRT XAML Toolkit Color Picker Sample, you’ll notice that after every Hue change, the inner triangle is entirely redrawn pixel by pixel. The control calls the RenderColorPickerSaturationLightnessTriangleCore() method in WriteableBitmapColorPickerExtensions. When the size of the control changes, the same algorithm is applied and everything is redrawn pixel by pixel. All in all, that’s a pretty heavy operation, and I can imagine that some hardware –like a cheap phone or an IoT device- will choke on this. The sample app is here on GitHub. It will be extended with demos of other Composition API effects. This entry was posted in Composition API, UWP on April 8, 2016 by xamlbrewer.